New generation of mounted mower conditioners from Kverneland with ground breaking QuattroLink suspension concept. The mowing unit is suspended by four suspension arms that allow the mowing unit to float independently float over the field, and adjust accurately to ground contours. The new QuattroLink mower has been designed for even more productivity and to handle tougher conditions than ever. With its´ accurate ground following ability and highly flexible working range QuattroLink provides supreme capacity.Ground pressure is easily adjusted from the tractor seat, hydraulically and with an easy to read pressure scale on the mower for clear guidance. The suspension provides NonStop BreakBack protection across the full working width, with no limiting factor on the left hand side of the mower, giving the driver true peace of mind during operation. New QuattroLink racecar suspension concept. Flexible suspension – 700mm working range, 400mm up and 300mm down. NonStop BreakBack protection across full working width. Like a race car you want better tracking, ability to go at faster speed and adjust instantly to changing field conditions when operating your mower conditioner. These are the main benefits you will experience when running the kverneland 3300 series and 53100 MT Vario. The four suspension arms provide the mowing unit with an exceptional flexibility in adapting instantly to demanding ground contours inviting for higher speed and more productivity. Our NonStop BreakBack system just got even better. With the new QuattroLink suspension this system now offers protection across the full working width of the mower, including the part closest to the tractor. There are no limiting factors on the inside part of the mower, giving the driver true peace of mind. When hitting an obstacle in the field, the mowing unit will instantly move backwards and up, and then return to the original position. 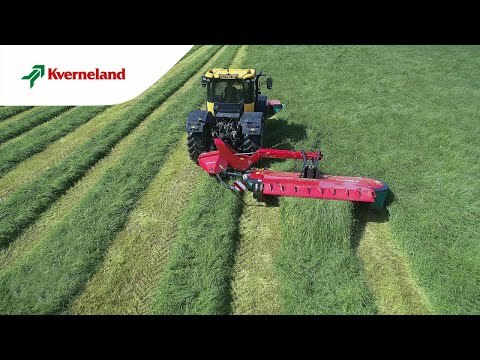 Kverneland 3336 MT Vario and 53100 MT Vario are fitted with hydraulic SideShift integrated into the carrying arm allowing each mowing units to move 400mm. To easily compensate for changing field conditions, the adjustable overlap is designed as a telescopic arm, directly into the suspension. For transport the mower folds into a compact position well behind the tractor. The folding design ensures that the weight is distributed evenly, with the weight of the mower close to the tractor. Transport height is well below 4.00m. With the integrated parking device, storage of the machine is made easy and convenient, requiring a minimum of space during winter storage. The mower is firmly parked on strong and stable parking foot, bringing total height below 4.00m. The new conditioner plate can be adjusted at both front and rear ends to customize the conditioner to crop intensity. The front end is adjusted separately to suit the crop intensity, even for massive crop, to avoid any blockages. Rear end is adjusted to ensure smooth and efficient crop flow into swaths or wide wide spreading. Utilizing centrifugal force is what makes the Kverneland SemiSwing conditioner stand out among other conditioning systems. It offers an aggressive conditioning effect while still offering excellent tine protection and virtually no wear and tear. During operation tines will stay in a fixed position, providing full conditioning with minimum wear. The new conditioner plate can be adjusted at both front and rear ends to customise the conditioner to crop intensity. The front end (1) is adjusted separately to suit the crop intensity, even for massive crop, to avoid any blockages. Rear end (2) is adjusted to ensure smooth and efficient crop flow into swaths or widespreading.